It’s important to understand the impacts a humid, tropical climate will have on bridge piping as opposed to those of a frigid, windy location. Here are just a few of the ways different climates can affect the ultimate performance of bridge-attached utilities. The materials used to construct bridge utilities are varied. Bridge piping ranges from traditional steel to corrugated aluminum to engineered PVC; each material reacts to changes in climate differently. Plastics, for example, become very brittle in extremely low temperatures making pipelines composed of composites more likely to rupture when temperatures dip. Conversely, pipes made of exposed steel installed in high-salinity, high-humidity locations are more likely to corrode quickly without galvanization and/or anti-corrosion wrapping. The climate around a bridge’s location directly affects whether or not bridge utilities require insulation, as does the material carried within the pipeline. Insulating natural gas pipelines can help keep pressure within the pipe stable, effectively reducing the risk of a leak. In locations where sub-zero temperatures are commonplace, proper cable jacketing and flame-retardant insulation should be employed alongside fiber optic cables. It’s always better to over-insulate than to under-insulate bridge-attached utilities. Climate change is poised to have a very real impact on the utility of bridges. 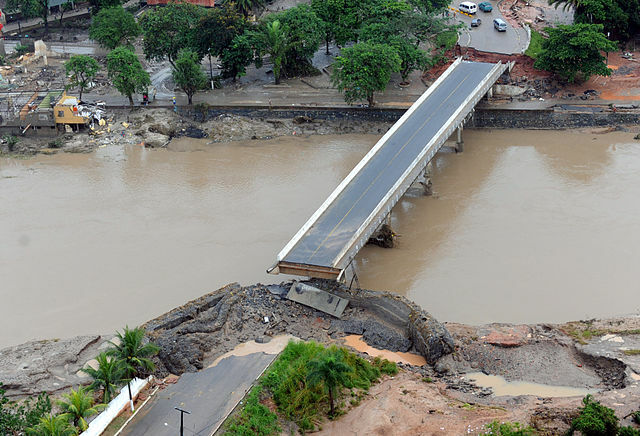 By some estimates, nearly 200,000 inland bridges will be rendered unviable by the end of the century due to flooding and rising water levels; bridges located in areas that suffer frequent storms are already suffering from the effects of climate change. Rising waters may necessitate a change in where bridge-mounted utilities are attached, and also to the strength of the attachment points themselves. Perhaps the aspect of bridge utilities most directly correlated to climate is maintenance. Just like homes and roadways located in areas with volatile or extreme climates require more maintenance, so too do bridges and their attached utilities. Environments that are subject to extreme cold, extreme heat, high-salinity, high humidity, and even frequent weather events like snowstorms, hurricanes, or hailstorms necessitate more frequent maintenance to bridge-attached utilities that may become corroded, damaged, or moist over time. Do you have questions about how your bridge’s local climate impacts the performance of its bridge-attached utilities? Aptus has been working with utility providers, governmental organizations, developers and many others for decades. We fully understand the environmental impact on the utilities bridges support. For a consultation with a bridge utilities technician in your area, reach out to the Aptus team today. Our process is simple, our people are knowledgeable, and our experience is unique.